...how flipping brilliant your headcollars really are!!! Hi, I just wanted to tell you just how flipping brilliant your headcollars really are!!! We first found one quite by accident whilst on holiday, a couple of years ago in Whitby, North Yorkshire.. We called into a pet shop (the name of which I can't remember, unfortunately) as we'd had enough of our headstrong malamute husky, dragging us around the narrow streets of the town,....in the hope of finding something more adequate, than what he already was wearing!!! We purchased one of your headcollars and our lives were instantly transformed........to the point that we got another dog........and let them have a litter of pups!!!! The 'mum' was introduced to your headcollars, and the pup we are to keep for ourselves, will wear one also when she's old enough. All the people who have had a pup off us, have been advised to get one of your headcollars too! as there is absolutely, nothing better that I could recommend for a husky-type dog, at all! We feed the lead from the headcollar, to the top ring of a harness, for maximum control, and it works just great! 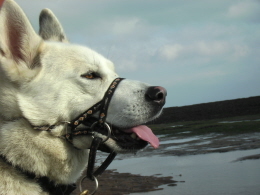 Your headcollars do just the right job and cause no discomfort to the pooch,.......and huskys, as you probably are well aware of, aren't the easiest of dogs to walk,on a lead without pulling!!!!!!!!!!! We live in the Wirral, Merseyside, and have found it difficult to find any of your products anywhere in the vicinity! I'm only mentioning this, as during this time of 'difficulty' in business, it may be a good area to find additional outlets in.